This TechnoGym arm bike Excite+ Top 700 Unity black used offers a number of positions for both seated and standing workout (seat is not included, it is sold separately) . 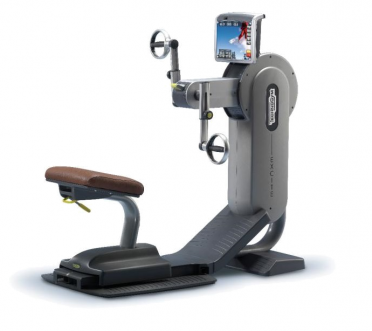 On this trainer you can exercise your shoulder, arm, back and chest muscles, which are stiff or flabby due to incorrect body posture, working in an office or when your a wheelchair. The handles rotate both around their axis and around the circle, thus allowing you to change positions and exercise different muscle groups. The Unity console provide a personalized mix of entertainment, new challenging workouts and innovative features that are designed to deliver results in a fun and easy way. This used crosstrainer has been completely checked and tested and is in a very good condition. Please note, the console on the photo is equipped with the optional TGS key reader. Ideal for any level of conditioning, TechnoGym lateral trainer Crossover Excite+ 500i black used engages multiple muscle groups through an effective cardio workout that also benefits your core, balance and coordination. The Cardio crossover introduces external rotation, extension, and abduction in one movement alongside a challenging cardio workout. 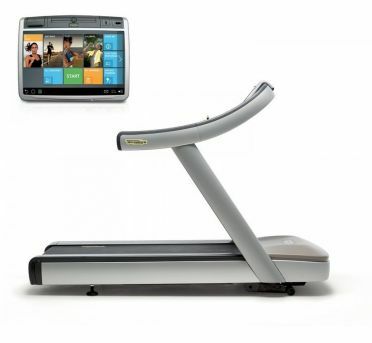 This crossover is equipped with the TechnoGym 500 LED display wich is less advanced than the 700 series but it still has got all the necessities. This used lateral trainer is in very good condition. Please note, the console on the photo is equipped with the optional TGS key reader. The TechnoGym treadmill Excite+ Run Now 700 Unity black used is a quiet treadmill with a soft, adaptable running area which allows you to move naturally on the running area. Its display is at such an angle that allows the user of any height to maintain their correct body posture while looking at it. The specially designed levers for adjusting the speed and incline of the running area provide additional comfort; their placement allows the user to use them even during an intensive workout. The 19 inch Unity console provide a personalized mix of entertainment, new challenging workouts and innovative features that are designed to deliver results in a fun and easy way. This used treadmill has been completely checked and tested and is in a very good condition. Please note, the console on the photo is equipped with the optional TGS key reader. This TechnoGym arm bike Excite+ Top 700 Unity silver used offers a number of positions for both seated and standing workout (seat is not included, it is sold separately) . On this trainer you can exercise your shoulder, arm, back and chest muscles, which are stiff or flabby due to incorrect body posture, working in an office or when your a wheelchair. The handles rotate both around their axis and around the circle, thus allowing you to change positions and exercise different muscle groups. The Unity console provide a personalized mix of entertainment, new challenging workouts and innovative features that are designed to deliver results in a fun and easy way. 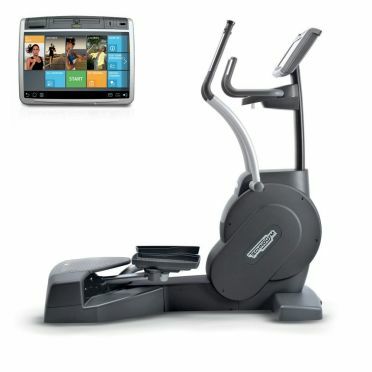 This used crosstrainer has been completely checked and tested and is in a very good condition. Please note, the console on the photo is equipped with the optional TGS key reader. Enjoy a more varied, stimulating and effective cardio workout with the TechnoGym arm bike Top Excite+ 700i classic silver used. This upper body rotary training improves your fitness, muscular strength, endurance and look. This arm bike features the classic 2006 model, this solid model is the beginning and one of the reasons for the success and popularity of the Top Excite series arm bikes today. The Top Excite comse with an ergonomic or an exclusive seat that can be easily disconnected from the device so that the Top can be used standing up or with a wheelchair. 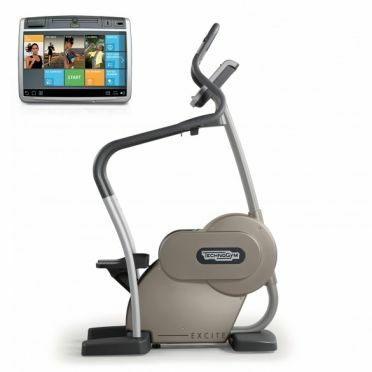 This model is equipped with a large LCD screen with lots of details about your workout, the screen also has a TV function. This used arm bike is in very good condition. Please note, the console on the photo is equipped with the optional TGS key reader. 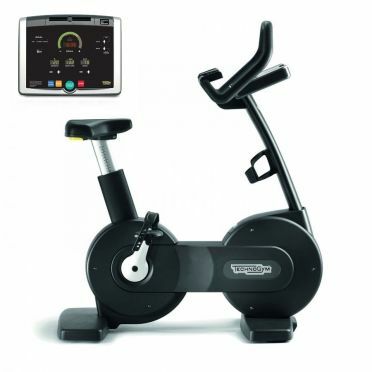 The TechnoGym excercise bike Excite+ New Bike 700 Unity black used offers a super realistic cycling experience and comes with the versatile Unity console. The bike's biomechanical and ergonomic design enables you to ride in as many as three different training positions – standard, race and urban bike. This was made possible by the specially shaped, multifunctional handles and adjustable seat height. Since the mechanism for adjusting the seat’s height is at the back of the seat, you can do it while seated. The Unity console provide a personalized mix of entertainment, new challenging workouts and innovative features that are designed to deliver results in a fun and easy way. This used excercise bike has been completely checked and tested and is in a very good condition. Please note, the console on the photo is equipped with the optional TGS key reader. 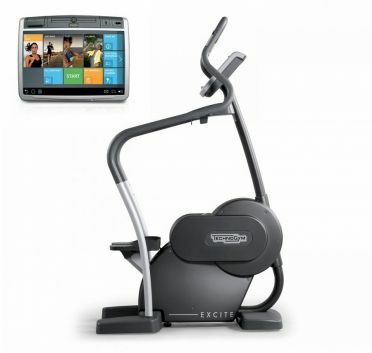 Enjoy a more varied, stimulating and effective cardio workout with the TechnoGym arm bike Top Excite+ 700 visioweb black used. This upper body rotary training improves your fitness, muscular strength, endurance and look. The Top Excite comse with an ergonomic or an exclusive seat that can be easily disconnected from the device so that the Top can be used standing up or with a wheelchair. 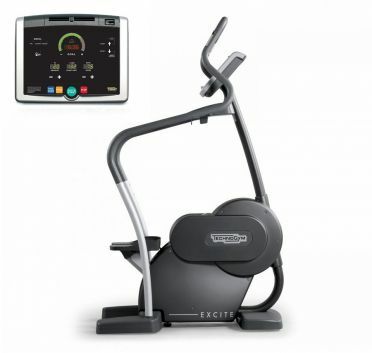 The Excite+ collection offers you a fully-connected cardio experience, the Visionweb console provide a personalized mix of entertainment, new challenging workouts and innovative features that are designed to deliver results in a fun and easy way. This used arm bike is in very good condition. Please note, the console on the photo is equipped with the optional TGS key reader. 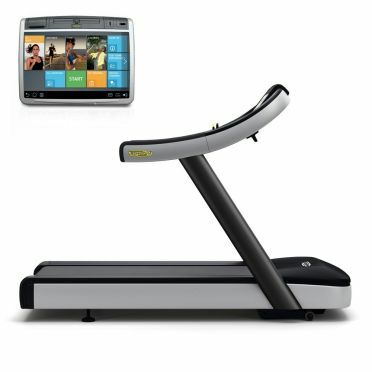 The TechnoGym treadmill Excite+ Run Now 700 Unity silver used is a quiet treadmill with a soft, adaptable running area which allows you to move naturally on the running area. Its display is at such an angle that allows the user of any height to maintain their correct body posture while looking at it. The specially designed levers for adjusting the speed and incline of the running area provide additional comfort; their placement allows the user to use them even during an intensive workout. The 19 inch Unity console provide a personalized mix of entertainment, new challenging workouts and innovative features that are designed to deliver results in a fun and easy way. This used treadmill has been completely checked and tested and is in a very good condition. Please note, the console on the photo is equipped with the optional TGS key reader. 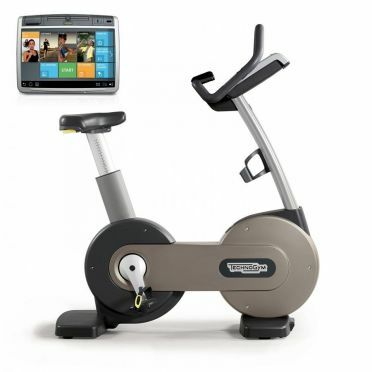 The TechnoGym excercise bike Excite+ New Bike 700 Unity silver used offers a super realistic cycling experience and comes with the versatile Unity console. The bike's biomechanical and ergonomic design enables you to ride in as many as three different training positions – standard, race and urban bike. This was made possible by the specially shaped, multifunctional handles and adjustable seat height. Since the mechanism for adjusting the seat’s height is at the back of the seat, you can do it while seated. The Unity console provide a personalized mix of entertainment, new challenging workouts and innovative features that are designed to deliver results in a fun and easy way. This used excercise bike has been completely checked and tested and is in a very good condition. Please note, the console on the photo is equipped with the optional TGS key reader. 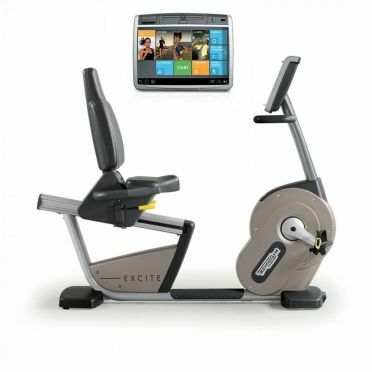 Enjoy a more varied, stimulating and effective cardio workout with the TechnoGym arm bike Top Excite+ 700 visioweb silver used. This upper body rotary training improves your fitness, muscular strength, endurance and look. The Top Excite comse with an ergonomic or an exclusive seat that can be easily disconnected from the device so that the Top can be used standing up or with a wheelchair. 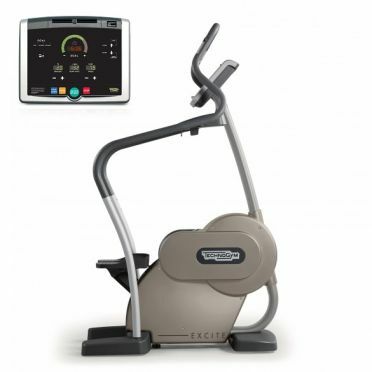 The Excite+ collection offers you a fully-connected cardio experience, the Visionweb console provide a personalized mix of entertainment, new challenging workouts and innovative features that are designed to deliver results in a fun and easy way. This used arm bike is in very good condition. Please note, the console on the photo is equipped with the optional TGS key reader. 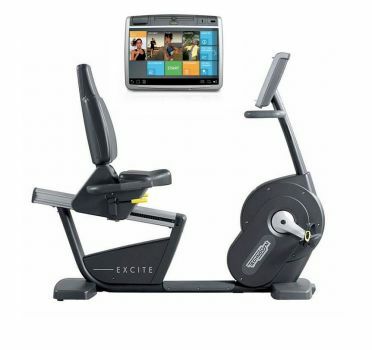 Enjoy a more varied, stimulating and effective cardio workout with the TechnoGym arm bike Top Excite+ 700i black used. This upper body rotary training improves your fitness, muscular strength, endurance and look. The Top Excite comse with an ergonomic or an exclusive seat that can be easily disconnected from the device so that the Top can be used standing up or with a wheelchair. The new colors add a stylish touch to the space and are the perfect solution for facilities that want to deliver a unique experience. This used arm bike is in very good condition. Please note, the console on the photo is equipped with the optional TGS key reader. 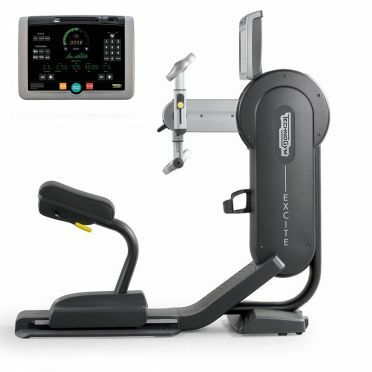 The TechnoGym recumbent bike Excite+ New Recline 700 Unity black used is a professional cardio machine which allows you to exercise your body in a backbend position. The large space between the seat and the pedals makes it easy even for users with reduced mobility or overweight users to get on/off the recumbent. If necessary, you can hold onto the handle underneath the display or the handles beside the seat. Once you are seated, it is easy to find a comfortable position. The padded seat and back support can be adjusted to 4 positions, thus allowing for a comfortable workout. This used recumbent bike has been completely checked and tested and is in a very good condition. Please note, the console on the photo is equipped with the optional TGS key reader. 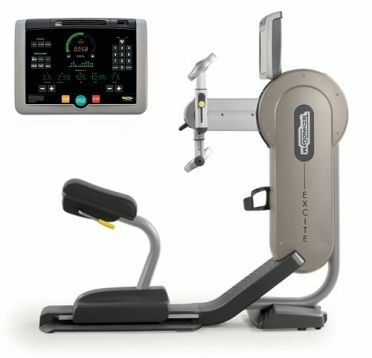 The TechnoGym recumbent bike Excite+ New Recline 700 Unity silver used is a professional cardio machine which allows you to exercise your body in a backbend position. The large space between the seat and the pedals makes it easy even for users with reduced mobility or overweight users to get on/off the recumbent. If necessary, you can hold onto the handle underneath the display or the handles beside the seat. Once you are seated, it is easy to find a comfortable position. The padded seat and back support can be adjusted to 4 positions, thus allowing for a comfortable workout. This used recumbent bike has been completely checked and tested and is in a very good condition. Please note, the console on the photo is equipped with the optional TGS key reader. Ideal for any level of conditioning, TechnoGym lateral trainer Excite+ Crossover 700 Unity black used engages multiple muscle groups through an effective cardio workout that also benefits your core, balance and coordination. The Cardio crossover introduces external rotation, extension, and abduction in one movement alongside a challenging cardio workout. The Unity console provide a personalized mix of entertainment, new challenging workouts and innovative features that are designed to deliver results in a fun and easy way. This used lateral trainer has been completely checked and tested and is in a very good condition. Please note, the console on the photo is equipped with the optional TGS key reader. Enjoy a more varied, stimulating and effective cardio workout with the TechnoGym arm bike Top Excite+ 700i silver used. This upper body rotary training improves your fitness, muscular strength, endurance and look. The Top Excite comse with an ergonomic or an exclusive seat that can be easily disconnected from the device so that the Top can be used standing up or with a wheelchair. The new colors add a stylish touch to the space and are the perfect solution for facilities that want to deliver a unique experience. This used arm bike is in very good condition. Please note, the console on the photo is equipped with the optional TGS key reader. Enjoy the sensation of riding a real road bike with the Technogym excercise Bike Excite+ 500i black used. 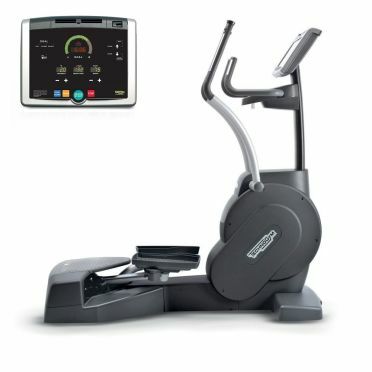 The hometrainer is equipped with the TechnoGym 500 LED display wich is less advanced than the 700 series but it still has got all the necessities. 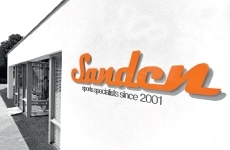 The biomechanics and ergonomic design offer a variety of positions to help you achieve peak performance. Offering 1 – 25 difficulty levels and a resistance of 30-500 at 70 SPM (Watts), this Bike is an exceptional option for your intense cardio training. This used excercise Bike is in very good condition. Please note, the console on the photo is equipped with the optional TGS key reader.